Having a nickname worthy of a modern-day superhero, or possibly even an arrogant American supremacist villain, August “Gus” John Schoenlein has a unique story that needs to be heard. He was called “Americus”, seemingly the first wrestler to go by just one name (after the famed Cain vs Able main event a long time ago - haha). We are in the 1910s and these were the days when Frank Gotch ruled the world - at least the American part (even before the Gold Dust Trio). His word was the Gospel in almost every town and county. Having compiled an impressive record. When Frank Gotch spoke, most people listened. He made his debut at age 17, won the World Light Heavyweight Championship from Fred Beell by 1908, and also won the World Heavyweight Championship on March 13, 1914 from the same Fred Beell. The latter came because Gotch handpicked the two most-worthy combatants in his opinion to fight for the title he was surrendering due to illness. Americus held the title for only about two months and then lost officially (HINT: don’t dare miss the 2nd story about Americus) on May 7, 1914 to the Polish strongman Stanislaus Zbyszko, who promptly took his new achievement and left the USA until 1921. 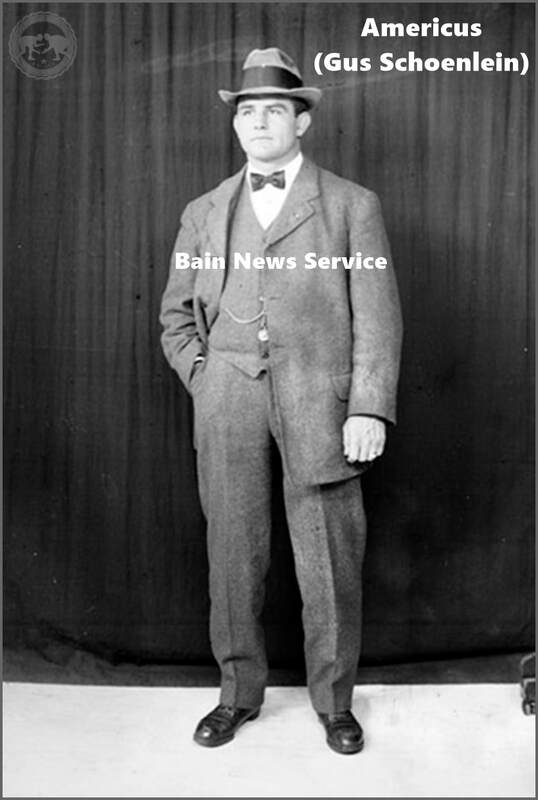 Soon after losing his wrestling title, at age 32 Americus went back to the “regular 9-5” world as Baltimore’s Building Inspector, which he had been college-trained for. As well as being a builder during his distinguished grappling career. He also coached the Princeton wrestling squad. This official loss turned future historians’ jobs to a complicated maze of “WHO SHOULD REALLY BE RECOGNIZED AS WORLD CHAMP” from that day forward. Stanislaus had proven his skills world-wide already and was called back to Poland due to the outbreak of World War 1, while he was enlisted in the army Frank Gotch declared Charlie Cutler was the real man that should be respected as such. From there, it gets worse. It appears that Gotch, until the day he died, was considered the World Champ in most metropolitan newspapers no matter who had the bragging right, because of this, sometimes Gotch was still called the World Champ even when in retirement and any other Americans were simply known as the American Champ. Gotch himself added to the confusion by “coming out of retirement” (ala Hulk, Flair and Funk), then his “christened and hand-picked” Champion was delegated to being an “extra” American Champion (though they tried to have their own lineage also). The American/former World champ lost a match and it caused further splintering. Add in some controversial matches, and one World Champ had become recognized by two different cities. In one article I came across, there were seven World Championship titles being defended on the same card, as so much controversy and politicking had splintered the World Title into three categories; talent in some cases, the most charismatic in some cases, and of course the ever-present strongest political machine in other cities. ​It now appears that the title of World Champion was possibly not Americus’ to be advertising that fateful day he lost it to the Polish star. Enter one Pat Connolly, a husky Irishman, who claimed he had beaten Americus twice in Vancouver, British Columbia, Canada before Americus’ match with Zbyszko, including just four days before he supposedly lost his (formerly Gotch’s) title. There are reported paper clippings showing matches of Connolly against the famed Dr BF Roller and even Americus occurred as Connolly defended “the” World Championship in June and July of 1914 in Vancouver. Was Americus the Champ that day he faced Zybysko? Should we view Zybysko as winning the World Title that day? What about the challengers Zybysko faced throughout the other parts of the world? What about Connolly’s claim to having been the Champion of the World? I challenge all of you to go find your own gold mine and work it until every nugget is found. This is what I plan on doing with this information. May it inspire you to find out the real truth for yourself. ​A special thanks to Jimmy Wheeler for inspiring me to look into this young champion’s mainly unknown life. This Society has driven me to discover wrestling gold mines that have enriched my life with deposits of discovery; like that day I found Mid-Atlantic Wrestling from the studios of WRAL on my TV that first Saturday afternoon.